Dr Thompson made this point to SEARCHLIGHT earlier this week as he reflected on last weekâs launch of Karib Cableâs fixed-line service here in St Vincent and the Grenadines. He said that it was his impression that in 2008, both of the telecommunications companies (Digicel and LIME) made âsubstantial profitsâ and he expects profitability to continue in the industry, with the advent of Karib Cableâs entry into the fray. 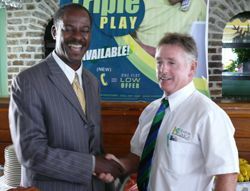 The Minister, who addressed last weekâs grand breakfast launch of the service which was held at the Cobblestone Restaurant, said that he was looking forward with excitement to the various deals that will be offered with the introduction of Karib Cableâs triple play (internet/ fixed line and Cable TV) promotions. Dr Thompson, who is the current chairman of the Eastern Caribbean Telecommunication Authority (ECTEL), said that he was proud to know that St Vincent and the Grenadines is the first country in the Caribbean to offer triple play services to telecommunications customers. Meanwhile, speaking at last weekâs launch, head of the National telecommunications regulatory Commission (NTRC) Apollo Knights said that it was not easy to attract investors to the fixed line market because it was costly to build a fixed line network. Knights said that there is room for expansion in the fixed line market, noting that only half of the households in this country have fixed line services, while calls costs as much as 10 times less than on mobile phones. Glass said that his company âgambled and invested heavilyâ in its fiber optic network, which he said was designed by the same company which designed the network of Rogerâs Cable, the leading cable company in North America. âThe (telecommunications) industry is one of the fastest growing industries by way of technology, and if you fall behind, you will struggle to keep up,â Glass said. Glass also said that his company intends to continue to expand its reach as it relates to providing telecommunications service in this country, saying that things are being put in place to have all their services available in the Southern Grenadine island of Mayreau. Karib Cableâs Marketing Department is promising hundreds of dollars of savings to customers who take advantage of their triple play offer.